Orange Files photograph of Baba that ripost.hu used without citing the source. On January 11, 2016, the on-line tabloid ripost.hu published an article entitled “Serial Criminal Ex-Convict at the Head of Soros’s Hungarian Migrant Organization!” (Börtönviselt, sokszoros bűnöző Soros magyar migráns­szervezetének élén!) 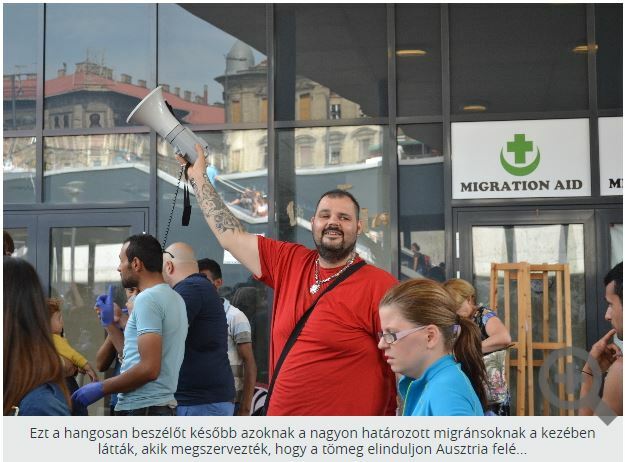 regarding Baba, the most prominent volunteer for the Migration Aid non-governmental organization that provided food, clothing and other forms of assistance to tens of thousands of migrants as they passed through Hungary on their way to Germany in the summer and early autumn of 2015 (source in Hungarian). 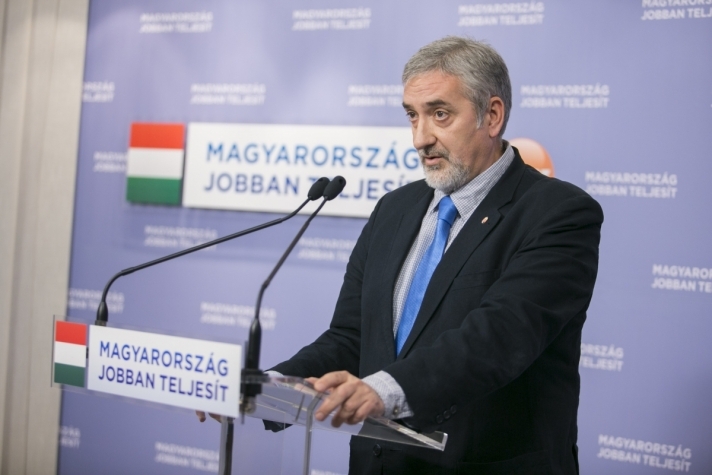 Fidesz National Assembly caucus Deputy Leader János Halász speaking at January 11 press conference regarding Baba and Migration Aid (source: fidesz.hu). The ripost.hu article cited no sources or evidence to substantiate its allegations regarding Baba or Migration Aid’s connection to the Soros Foundation. The article used a photograph of Baba from the Orange Files gallery Scenes from the Great Migration 3: the Eastern Railway Crisis without citing the source. Baba responded almost immediately to the ripost.hu allegations, writing in a Facebook post that “I am neither a saint nor an angel. I am a person who tries to help those in need. I have never been a criminal, I was not taken into custody at the Eastern Railway Station and there is no warrant out for my arrest” (source in Hungarian). Good day dear ladies and gentleman. I respectfully welcome you in the name of the Fidesz National Assembly group. Today we encountered shocking news. According to a report from an on-line news portal, an ex-convict, criminal repeat offender was active at the head of one of the biggest migrant-assistance organizations in Hungary. A criminal who was in prison on several occasions and who has already committed many crimes, among them fraud and forgery of public documents. According to the news, this criminal was one of the main organizers of the Migration Aid organization that, in fact, belongs to György Soros and assists migrants and migration both here and at other points in Europe. As is known, this was the organization that promotes illegal migration through the provision of guide books and other services and which organized a demonstration in the autumn against the government’s planned legal and physical border barriers. First of all, we would like to find out if the news is true. Is it true that a criminal repeat offender organized affairs surrounding migrants? If this news is true, it is shocking. We don’t understand it and we ask how a criminal can fill such a position. We demand that an investigation be carried out within the organization itself. And, if necessary, within other forums as well because this affair could entail very serious national-security risks. According to the news, a criminal organized the affairs of illegal migrants and did business with them, taking care of money, documents, various services and who knows what else for the illegal migrants. This person may have deceived many well-meaning volunteers as well. It is questionable whether or not György Soros’s foundation new about this matter. I can hardly imagine that it did not. We also ask for help from the media in order to determine the truth. Rather than silence, an enquiry is needed so that we can truly find out whether or not it is true that a criminal repeat offender handled the affairs of the migrant organization and the immigrants. We wish you good work! Following Halász’s press conference, Migration Aid Spokesperson Zsuzsanna Zsohár told the website index.hu that the organization had never received “a penny” (fillér) from the Soros Foundation (source in Hungarian). Meanwhile Baba told the website origo.hu that “I am not a criminal repeat offender, neither am I a heavyweight mafioso as they have said I am—this is slander. I have spoken with my lawyer and we are going to take the necessary steps, we are going to sue the newspaper and the journalist that wrote this about me” (source in Hungarian). On January 13, ripost.hu published an article stating that the website had obtained a copy of the Budapest Court decision to uphold a four-and-a-half-year prison sentence that Baba had received for committing fraud worth 98 million forints (310,812 euros). The article asserted that Baba is currently facing another charge of fraud worth several million forints (source in Hungarian). The ripost.hu article alleged that Baba had “hit pay dirt in the migrant business,” reiterating the website’s previous claim that he had exploited the passage of several hundred thousand migrants through Hungary in the summer and early autumn of 2015 to conduct illicit business involving the trade of jewelry for various electronic goods and services, including residence permits and marriages of convenience. Also on January 13, Baba conducted a half-hour interview with nol.hu, the on-line edition of the opposition newspaper Népszabadság, in which he acknowledged that he had served time in prison and that he had since been questioned in connection to another criminal investigation (source in Hungarian). However, Baba denied that he had received compensation for services provided to migrants passing through Hungary in 2015 and confirmed that he intended to file a lawsuit against ripost.hu on charges of slander.